Ratna Shrestha/RSS A tunnel portion dug from Sundarijal and another portion dug from Sindhupalchowk have linked up on Wednesday, according to the Melamchi Water Supply Project. The project calls it a breakthrough. The total length of the tunnel is 27.5 km. KATHMANDU, Dec 29: Tunnel work in the Melamchi Water Supply Project (MWSP) had a major breakthrough on Wednesday and officials said it's a milestone toward bringing Melamchi water to the capital city. After about eight years of tunnel work, the digging from the Sundarijal face met with the tunnel excavated from Sindhu and now a 9.38 kilometer tunnel is clean through. Two similar breakthroughs are expected to be made in a few months. 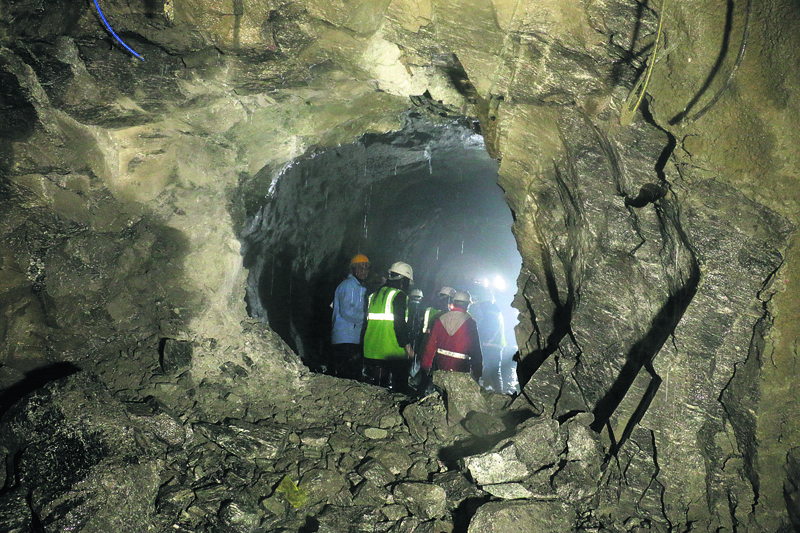 The tunnel breakthrough took place at 3 p.m., Executive Director of MWSP Ghanashyam Bhattarai said . "This achievement has made us confident the water will be supplied to Kathmandu by October next year," Bhattarai told over 100 cheering workers and employees inside the tunnel. “We consider this one of the longest water diversion tunnels in Nepal." added Bhattarai. Only 5.52 km of tunnel work remains in the 27.5 km tunnel project and this makes for 80 percent progress. Issuing a press statement, Country Director of Asian Development Bank Nepal Resident Mission Kenichi Yokoyama said, "We are literally seeing light at the end of the tunnel. We have been committed to this crucial project through thick and thin and are glad that water will soon start flowing." ADB has lent a total of US $ 145 million for the US $ 355.4 million project and also a separate US $ 170 million for a service reservoir and distribution network. Work on building the treatment plant is underway at Sundarijal and progress in laying the distribution network is also underway. Water from the Melamchi river will reach Sundarijal Treatment plant in 48 hours and it will be supplied to households within another 24 hours after treatment, said Bhattarai. Another 340 million liters of water daily will be brought from the Yangri and Larke rivers by 2021 through the same tunnel. Italian Contractor Cooperativa Muratori e Cementisti di Ravenna (CMC) started work on the project in July 2013 after the contract with the Chinese contractor was terminated in September over non-performance. Melamchi is a much-hyped project dating back over three decades.